Thanks to Jim Heavey’s class on Spray Finishing at Weekend with WOOD this past weekend, I’m really looking forward to breaking out my Earlex Spray Station and finally letting it do what it does best…allow me to spray on a finish in half the time it would normally take by hand. If you’ve ever thought about getting into spray finishing for your projects and wondered where to get started without breaking the bank or having to buy a lot of equipment and piece it together yourself, a system like the Earlex 5500 HVLP Spray Station is a nice way to go because everything you need is pretty much included. You’ll need to provide your own finish, but at the current sale price for this Earlex model at Highland Woodworking (please check availability and dates) you’ll be able to afford MORE of it. 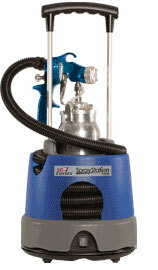 Purchase an Earlex 5500 HVLP Spray Station by clicking on this link and help support the show!